An acceptance fee of $300 is required in order to confirm your reservation. Payment details will be reflected in the housing offer. Weekly cleaning provided for the common areas. Optional weekly cleaning for rooms and ensuite bathrooms. 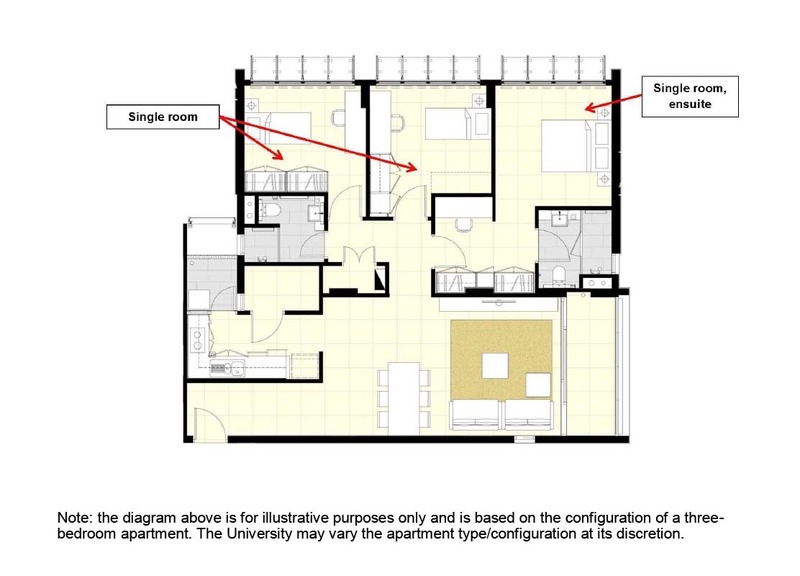 Note: Each of the common bedrooms is furnished with a single-sized bed (refer to the layouts below). Residents are to use the existing beds provided to accommodate up to the maximum occupancy listed above. Residents may purchase their own portable bed(s) if they intend to accommodate a 2nd person in each of the common bedroom(s). For more details on occupancy, please refer to the housing terms and conditions which will be sent together with the housing offer. 1- to 3-bedroom apartments. Sizes range from approx. 54 to 117 sq. m.